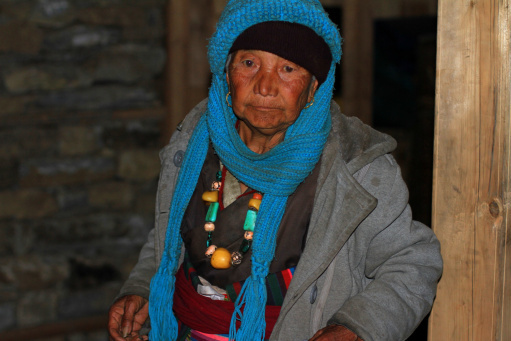 Nimchola is a small Sherpa village in Gudel VDC of Solukhumbu with just 24 households. It is one of the most remote settlements in the entire district – at least two, if not three, long days of walking from the nearest road. 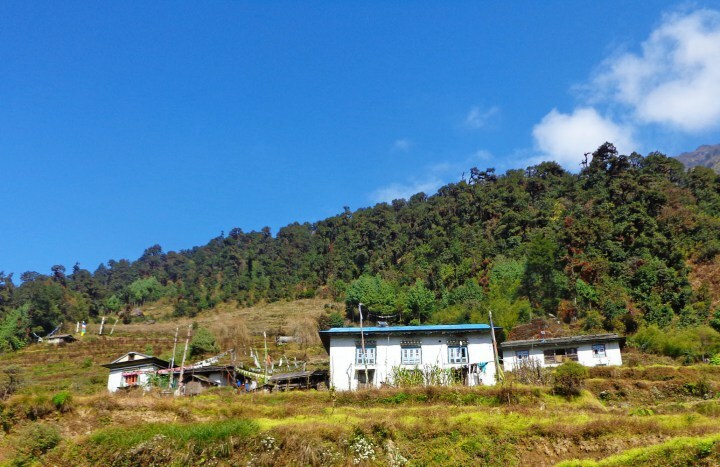 Nimchola is tucked onto a steep slope and surrounded by dense forests that run all the way up to the Makalu Barun National Park. 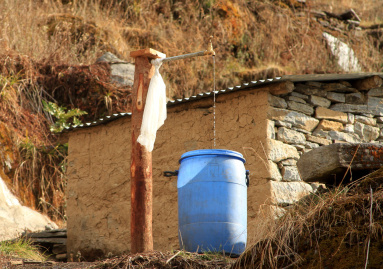 dZi helped our local NGO partner in Gudel construct over 800 toilets in the entire village of Gudel – including Nimchola. This allowed Gudel to become the first ‘open defecation free’ community in the entire district – a tremendous accomplishment for an area recognized as being one of the most remote and under developed. After the Toilet Project, the community of Nimchola requested a drinking water scheme as they had dire need of drinking water. Local residents had been forced to walk for up to an hour and a half to gather water from often-dirty sources. One of the local residents related to us that “his daughters wept as they were sent to fetch water because it was so far, and their bodies would ache while carrying heavy loads of water.” In Nimchola, like many small villages in Nepal, the men primarily migrate away in search of temporary work. Here, most of the men work as porters and guides on treks in the Everest region. Accordingly, it was the women, children and young girls who were burdened with difficult household chores including fetching water. Also, many households living in downstream were forced to consume polluted water as the people upstream would wash clothes, utensils and until sometimes ago defecate in the water source. This problem of water pollution led to many conflicts, and created schisms within the community. During dry months when the streams dried up, people had to depend upon water from stagnant wells (kuwa) which are dirty, and full of germs. Because water was so scarce, people hardly used the water for any other purpose besides cooking and drinking. Bathing, use in toilets, or in vegetables was unthinkable. Without proper access to water – toilets are nearly impossible to maintain and keep clean. Communities as small as Nimchola are nearly always overlooked by Government or NGO sources on account of their remoteness and small size. But this is exactly why their request for drinking water appealed to us at dZi. 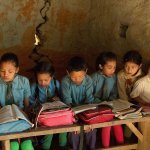 Our unique approach to development where we devise projects by collaborating with the community to match their needs has made seemingly unfeasible projects like this possible throughout our years of working in Nepal. When dZi approved of this project in 2013, the community was more than willing to share their part of labor contribution. Of the total project cost, the community contributed 33% with their labor which is worth approximately $8,700. 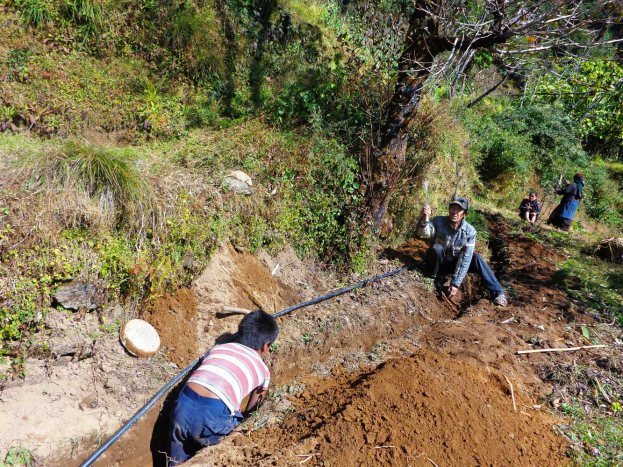 This ended up being a total of 1725 days of labor contributed by the community – most of which involved the hard labor of transporting supplies and burying drinking water pipe – a tremendous feat for a community of only 24 houses. 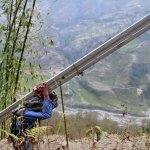 Our high engineering standards required that the water pipeline be buried deep in the ground to avoid damage by livestock or landslides. This required an amazing amount of work, which the community expressed time and time again that they were happy to give. Communities like Nimchola may be cash-poor, but they have ample motivation, resilience and strength. In our project impact evaluation, 70% of the community members reported a dramatic increase in their daily water usage after this project. Specifically, women reported that water accessibility has been very beneficial to schoolchildren who can now bathe regularly and wash their clothes – whereas earlier they were forced to attend school in dirty attire. Now that the water is available regularly at each household, people have started to raise cattle near their homes, grow vegetables in kitchen gardens and to use it in their toilets. Mothers reported that their kids who earlier spent all their time fetching water now has time to study in the free time. To ensure the long-term sustainability of the project, everyone in Nimchola has contributed to a trust fund where each household donates Rs. 500 per month for maintenance and repair. They are also in the process of registering the water source with the Government thus ensuring full water rights, and access to Government funds to maintain the system well into the future. The water user’s group here have successfully registered themselves with the Government of Nepal. This will mean that if any large damage occurs to the project, they will be eligible to get repair and reconstruction funds from the Government directly. Next Off we went to the Lake City!